Chin-Lu held her grandmother’s hand as they walked through the park. "Grandmother, this is my favorite time of year. I love spring." "Why do you love spring, Chin-Lu?" Grandmother asked. "I love the cherry blossoms, baby birds, bumblebees, and the sunshine," Chin-Lu answered. "Isn’t it nice that we have different seasons. Imagine if it was always winter. What if it stayed the same all year long?" Grandmother said. "I wouldn’t like that. I don’t want to have snow on the ground all year long. I don’t want to have autumn leaves all the time either. I like it when the seasons are different. 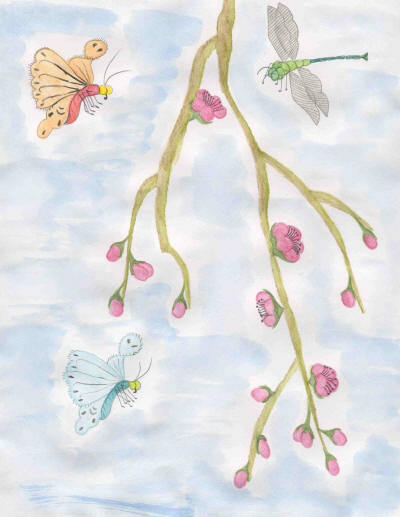 If it was winter all the time we’d never have butterflies or dragonflies," Chin-Lu replied. "Do you see those butterflies fluttering about in the cherry blossoms?" Grandmother asked. "I see two butterflies and one dragonfly. They aren’t the same either. They are different," Chin-Lu smiled. "Even the butterflies are different. One has blue wings. The other has orange wings, but they are both butterflies," Grandmother explained. "Can we have our picnic now? I’d like to sit under the cherry blossoms and watch the dragonflies and butterflies," Chin-Lu said. "We’ll stop right here. We can see the pond from here too. Look at the fish swimming about. They are all koi, but some have more orange and some have more white. They are different. That’s what makes everything unique and beautiful. Nothing is the same," Grandmother said. "I love spring," Chin-Lu giggled. They ate their picnic and enjoyed the beautiful things in the park.